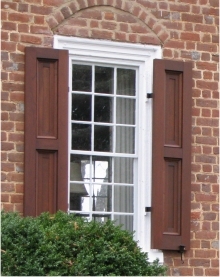 Custom Shutters customized by customer? Try saying this fast a few times! 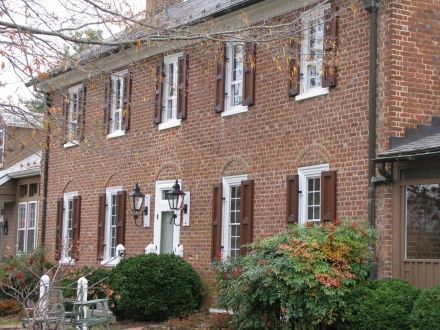 Not too long ago we manufactured these custom exterior wood shutters in a DIY Shutter kit for this beautiful brick home. The customer wanted to create the look of a deeper relief to the inner wood panel. This was achieved by supplying an additional 3/4 inch thick wood stock made to the same widths as the stiles and rails. The additional materials provided were laminated to the shutter frames by the customer and the extra thickness added gave the deeper recessed appearance that they wanted. “I have attached a couple of pictures in regards to the latest project we did using your shutters. We were very pleased with the quality and workmanship of the shutters. Assembly of the shutters went very smoothly and the extra pieces that we applied gave the shutters a nice depth for the application. It was a pleasure doing business with you, and your company was very accommodating with the specialty items that we requested.